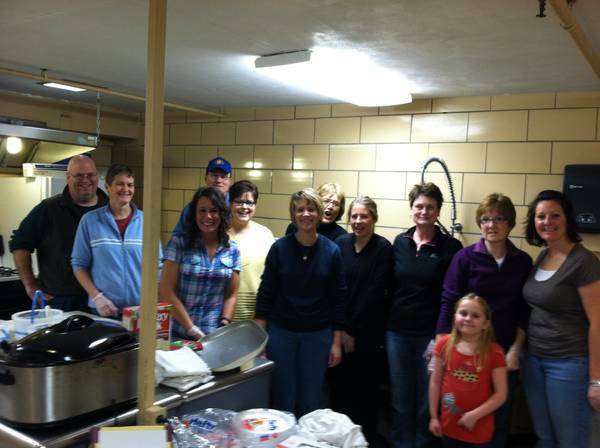 From the left: I was joined last year by friends Julie Rose, Danelle Much, Bob Nicolai, Pam Collins, Cathy Weikel, Carol Ward, Nancy Foxen, Diana Tank, Paula Durham, Megan Randoll and her daughter, Kiley Randoll, to help serve the meal for Loaves and Fishes at Muscatine Center for Social Action. We were also helped by Weikel’s son, Jared Weikel, who took this photo, Jeane Arnette and her grandson, Mark Miller II. If you are a Muscatine-area resident and a regular reader, I need your help from 9 a.m. to 1 p.m. on Saturday, Feb. 23, in the dining room at MCSA. That is when the organizers for the Loaves & Fishes meal program for the needy needed some volunteers to step forward. After organizing a group that helped serve this meal about this time last year, I told the program’s volunteer organizers that I would twist arms and convince some of my friends to help prepare and serve the meal again and then clean up when we are done. A total of four gallons of milk. Enough dessert for up to 100 people — 104 were served on Feb. 9. It’s best to keep it simple: Nothing with peanut butter or any kind of nuts. Buying cookies is perfectly acceptable. Two people to begin preparing the meal at 9 a.m.
At least seven to eight people working from 11 a.m. to 1 p.m. to serve the meal and clean up. As I recall from last year, it works best to have some volunteers plate the meals on an assembly line and others to work as waiters and waitresses who serve the meals and drinks the same as they would in a restaurant. This is a very worthwhile cause — one in which your entire family could participate. Several of my friends who helped last year brought their children or grandchildren. In fact, the kids were great servers. I hope to hear from a lot of you. You may reach me by posting a comment here or sending me an email at brome.hill@gmail.com. Thank you for considering this and agreeing to help. I’m looking forward to working with you on Feb. 23. If everyone shows up, it looks as if about 12 adults and six or seven kids have volunteered. Thank you, everyone, for volunteering to help. And if you’d still like to help, please let me know. I’d say we could use a few more volunteers because things will happen so that not everyone can make it.